Combine 1/4 cup of each into a spray bottle. Easy Peasy!! 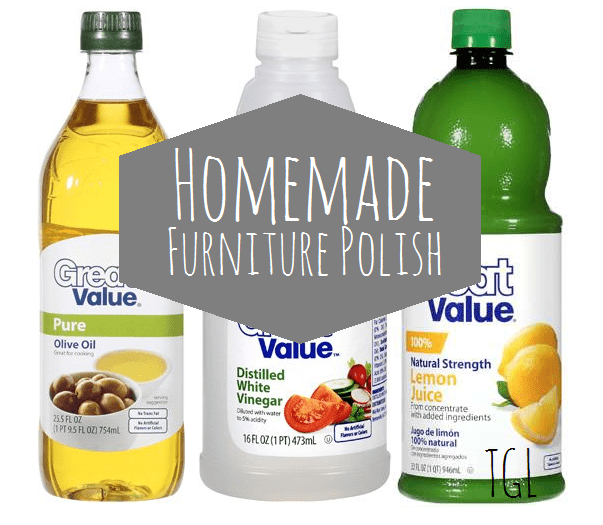 The olive oil will help nourish your wood furniture while the vinegar and lemon juice do all the cleaning. The lemon juice helps provide a nice scent to boot. Do not spray the mixture directly onto your furniture. Just like regular furniture polish you will want to spray onto a cleaning cloth. This mixture works best on real wood furniture so be sure to pretest your mixture on an inconspicuous part beforehand. Is there something specific that you would like to see a homemade solution for? Let me know! Thanks for the follow! I’m following you back from the Aloha Hop! ohh this looks really good! Thanks, I need to make this! Can’t wait to read more of your blog! Great recipe! Thank you so much for sharing.